Sorry, I know I've been a bit absent. We finally moved completely into our new little house and the old one is history! Unfortunately, the computer was one of the last things to go because we didn't yet have internet at our new place and thus, no posts. You have my sincerest of apologies. But now I'm back! Onto today's post. The first post and photos done in our new place! Anyway, one day, in the big city Anchorage while shopping for our new couch I stopped to get some quick dinner . Shopping really takes it out of me and I needed something totally delicious to take my mind off the task at hand and refresh my decision making skills. I decided to stop at New Sagaya (a local health food/ethnic grocer) to see what they had available. What I found was a vegetable chow mein. Not my usual lunch fare, but I thought what the heck. Sweet sassy molassy! Upon tasting these mind-blowing noodles I asked myself, "Why haven't I been eating chow mein every damn day of my life?" Since that very fateful day (we did find a couch too, afterall) I couldn't stop thinking about the chow mein. I knew I needed to make it myself. So, I lowered my standards. Like, super low. So, sooo low. I'd never made it before! Well, when my chow mein was done and I tasted it...it was exactly like the one I had bought at New Sagaya, albeit less greasy, which I was very pleased about. It was uncommonly delicious. There are a few tips and tricks regarding this recipe that will indeed gift you with the best chow mein you've ever made. - First, I did a little research on chow mein noodles by consulting America's Test Kitchen to find the best type to use. They recommend the tangled chow mein noodles as opposed to the straight kind and be sure they are not fried! You'll want dried noodles as well, not fresh. I read that if you're not blessed with finding said noodles, to substitute regular dried linguine instead. I know, sounds crazy but ATK has never let me down. So, prepare to amaze your friends, family, and yes, even yourself with your awesome ability to create the most perfect vegetable chow mein. 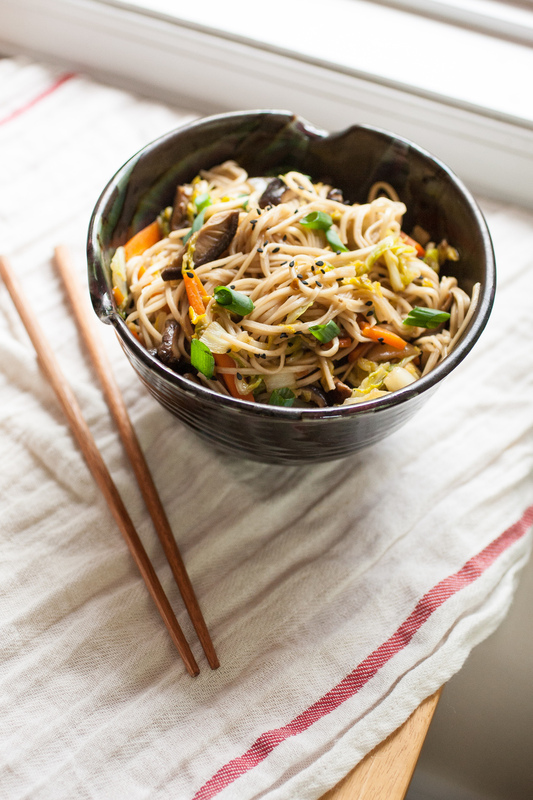 These perfectly textured noodles are infused with a homemade Asian sauce and tangled with sauteed Napa cabbage, carrots, and rich Shiitake mushrooms. Notes & Tips: It's important to use the right noodles! Find the non-fried chow mein noodles that are tangled, as opposed to straight. The noodles should be undercooked. There will seem to be an excess of sauce, but the undercooked noodles will soak it all up! In a medium bowl, add the dried mushrooms and cover with a substantial amount of boiling water. Allow to rest until ready to use, at least 20 minutes. In a very large rimmed frying pan, heat the olive oil over medium-low. Add the garlic and saute for a couple minutes, until fragrant. Now, add the carrots and saute about 3-5 minutes, while preparing the cabbage. Add the cabbage and saute until almost tender and wilted. This can be done in batches if the pan won't accommodate all the cabbage at once. Meanwhile, bring a very large pot of water to boil. While the water is coming to a boil, whisk together the sauce ingredients in a medium bowl or measuring cup. When ready, remove the mushrooms from the water with a slotted spoon. Slice and add to the veggies. Add the noodles when the pasta water comes to a boil and cook only 3 minutes. They need to be undercooked. Drain and add to the veggies along with the green onions. Stir well to combine. Pour the sauce into the noodle/veggie mixture and continuously stir over medium-low until the liquid is almost completely gone. It'll be ready when the noodles start to stick to the bottom of the pan a bit. Remove from heat and serve hot, garnished with a sprinkling of sesame seeds. Good Deed of The Day: Help Free the "Sentosa 25" from Resort World in Sentosa Singapore. Twenty-five bottlenose dolphins that once roamed free and wild are now facing a life of captivity and sadness as permanent residents of Resorts World - Sentosa, Singapore. These dolphins were captured in the waters of the Solomon Islands and are now being kept in the Philippines while the new facility at Resorts World Sentosa is being built. Two of them have already tragically died.